With the availability of nontoxic systems for WBH in carefully selected patients (Robins 1984; Robins et al. 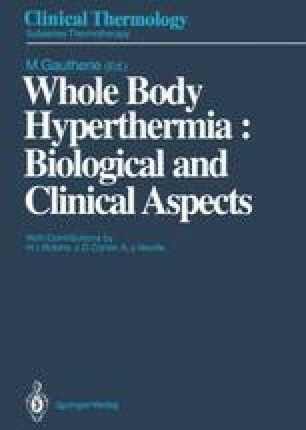 1989 a), the potential for utilizing systemic hyperthermia in nononcological settings presents itself. The collagen vascular diseases represent an area of special interest in this regard. We have anecdotally observed significant improvements in various incidental arthritic conditions in cancer patients undergoing WBH. Although this may be in part a reflection of WBH-induced β-endorphin release (Robins et al. 1987 a, b), these observations could be explored in the context of phase I and phase II studies.